At Brookhaven National Laboratory, we have many opportunities for interaction with students and the public. An unusual opportunity arose in the summer of 1995. A high school student, Erica Sanders, wrote to the Lab asking for a chance to do research. Her exceptional resume indicated that she had completed calculus as a sophomore and possessed a strong interest in science. We interviewed her and found her quite poised and interested. Exploiting the diversity of Brookhaven, we scheduled a meeting with staff from our Medical, Instrumentation and Physics Departments to find out what was going on in this field. We found the most interesting and pressing problem to be in digital mammography. The rate capabilities and position resolution of the CSCs show promise in this field. Erica's CSC project actually encouraged one of our physicists to think about other chambers that might be even more appropriate for this purpose. 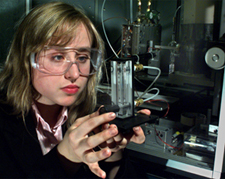 Erica has been exposed to a wide array of problem-solving techniques and to the way collaborative research works. She has had the opportunity to interact with some of the best people in their fields and the best equipment. What will come out of this collaboration is not yet clear ­ we are all still working.